Microgynon 30 is a combined oral contraceptive pill taken by women to prevent pregnancy. 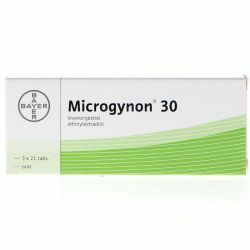 Microgynon 30 is one of the most reliable reversible methods of contraception when used correctly. The Microgynon contraceptive pill is prescription-only. Prevents the egg being released from the ovaries. The fluid (mucus) in your cervix becomes thicker, making it more difficult for sperm to enter the woman's womb. Prevents the womb lining thickening enough for an egg to embed itself. Microgynon 30 is a 21-day pill: Take one each day for 21 days, followed by 7 days when you take no pills. It commonly makes your periods regular, lighter and less painful. Microgynon 30 will not, however, protect you against STIs and STDs, the only contraceptive that can do this is condoms. Microgynon needs to be taken as directed to prevent pregnancy. Take Microgynon tablets every day for 21 days. The Microgynon contraceptive pill comes in strips of 21 pills, each marked with a day of the week. Take your pill at the same time every day. Start by taking a pill marked with the correct day of the week. Do not chew the pill and ensure that each tablet is swallowed whole. After you have taken all 21 pills in the strip, you have seven days when you take no pills. So if you take the last pill of one pack on a Friday, you will take the first pill of your next pack on the Saturday of the following week. Within a few days of taking the last pill from the strip, you should have a withdrawal bleed like a period. This bleed may not have finished when it is time to start your next strip of pills. You don’t need to use extra contraception during these seven pill-free days, as long as you have taken your pills correctly and start the next strip of pills on time. Start taking your next strip of Microgynon pills after the seven pill-free days, even if you are still bleeding. As long as you take Microgynon correctly, you will always start each new strip on the same day of the week. 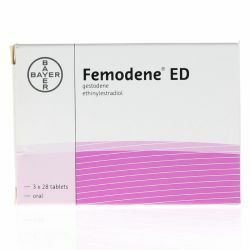 Each beige sugar-coated tablet contains 150 micrograms of the progestogen levonorgestrel and 30 micrograms of the oestrogen ethinylestradiol. Before starting Microgynon 30, it is particularly important to read the symptoms of a blood clot section in the Patient Information Leaflet. It’s important that you understand both the benefits and risks of taking Microgynon before taking it or when deciding whether to carry on taking it. Although the Microgynon contraceptive pill is suitable for most healthy women, it is not suitable for all. Microgynon 30 contains lactose and sucrose - if you have been told by your doctor that you have an intolerance to some sugars, contact your GP before you buy Microgynon 30 online. Do not use Microgynon if you are pregnant. In addition, if you are breastfeeding, your doctor or family planning nurse may advise you not to take Microgynon 30. They will be able to suggest alternative contraception.